Specialized Equipment - Encore Trucking & Transport Ltd.
Our specialty lifting equipment allows us to access environments that other cranes cannot. Our engineered jibs, reverse knuckles & custom dead sticks are a huge advantage for interior and low profile lifts. They come in handy when installing loads near ceilings or inside doorways. This equipment is a great way to access engines and compressors in pump stations, transformers and AC units under awnings and basically any other object tucked inside a doorway or building. We often perform tandem lifts with two of our units at the same time. 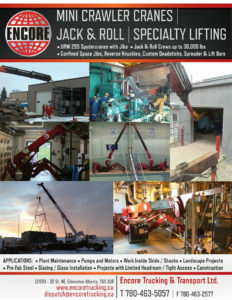 We have done lifts with two straight booms, two knuckle booms, two mini cranes and any combination of the two. Often overall weight is the reason for doing a tandem lift but others include, unevenly weighted objects, flipping a unit around or righting a load. Some of our most unique and toughest lifts have been tandem lifts. Our straight booms are able to man-basket work to a distance of just over 200′. Often used for signage or high access, our man-baskets are engineered for safety. We even offer a man-basket for our mini cranes for those indoor applications. Finally, we have several custom spreader bars and lift bars for those loads that require specialty rigging.